Ladd, Sarah. The Heiress of Winterwood. Nashville, TN: Thomas Nelson, Inc. 2013. Amelia Barrett made a promise upon her friend’s deathbed to take care of her baby, Lucy, as her very own. 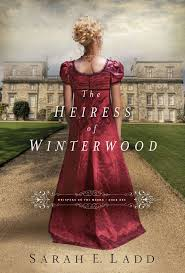 As heiress to the Winterwood estate upon marriage, Amelia finds herself betrothed to Edward Littleton, a man whose character is different than originally portrayed and who refuses to allow Lucy to stay. Upon Captain Graham Sterling’s return from sea, Amelia must explain his wife’s passing, introduce him to his daughter and make quick plans to ensure her bond with Lucy remains. Through many twists and turns, friends and foes, lies and loves, Amelia and Graham must learn to work together for a chance at their happily-ever-after. This book was outstanding, even more so as it was Sarah Ladd’s debut novel. The characters, faith, time frame (Darbury, England: 1814), writing style, word choice and story line all kept me fully engaged until the end. I thoroughly enjoyed this story from start to finish…I was only disappointed when I read the last page! Fortunately, I have the sequel, The Headmistress of Rosemere, on my shelf to read next. Bravo!! Hochstetler, J.M. 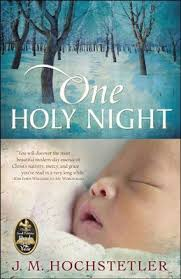 One Holy Night. Elkhart, IN: Sheaf House Publishing. 2008/ Revised 2013. I was drawn to this book by the beautiful cover, intrigued by the stained glass picture on the back, and absolutely absorbed by the story. I found this novel to be a very powerful one in many ways. The characters were well developed and genuine in their thoughts, feelings, actions, and faith. Even though I had an idea of where the story line was headed, I couldn’t put the book down (thus, reading it in less than a week)! 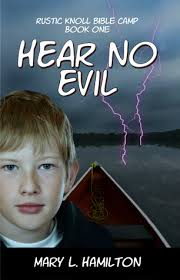 I also appreciated the creative element in this story which incorporated the Nativity into a contemporary yet emotional message that still has me reflecting. This was my first experience reading a novel by J.M. Hochstetler and I have appreciated the opportunity. Be sure to take the time to read the Acknowledgements at the end of the book for interesting tidbits about the front cover and stained glass piece from the back. Steel, Danielle. Pure Joy…The Dogs We Love. New York, NY: Random House Publishing Group. 2013. The author, Danielle Steel, creates a memoir of the many dogs she has known over the years, spotlighting her relationship with her current dog, Minnie Mouse, a two-pound Chihuahua. Through musings, memories, stories and thoughts, Danielle Steel shares her love of dogs and their lifelong effects on our lives. From total happiness to utter chaos, she reminds readers why dogs are so popular with so many. 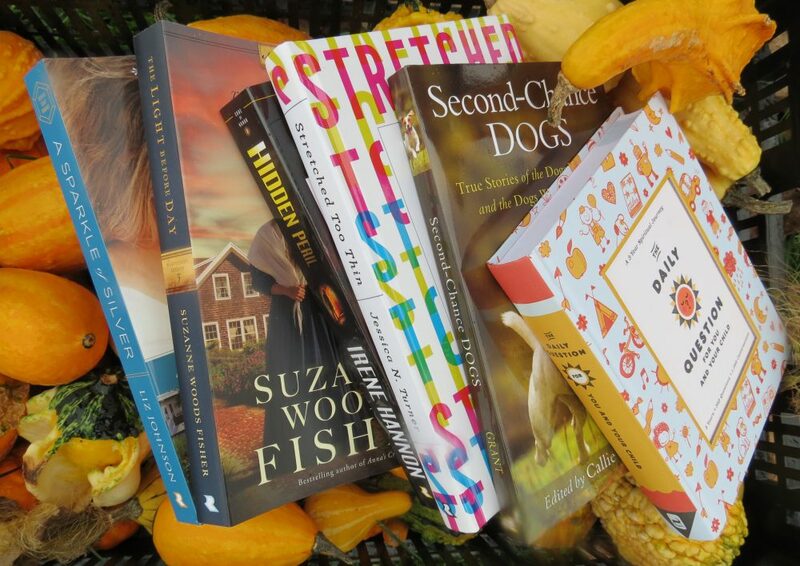 Aptly named, this book put a smile on my face as the author candidly spoke of her many dogs. Explaining she loves dogs as much as children (nine children-eleven dogs), she shows the “pure joy” her dogs have brought into her life (for the most part). Though I did not necessarily agree with all her dog actions/ experiences, I could relate to the emotions and turmoil puppies and dogs can evoke. Actually, when reading deeper into the book, Danielle states “allow yourself the luxury of letting happiness be whatever it is to you”. She found that happiness in her current dog, Minnie Mouse, although it could be anything in life. She goes on to say “why not” do something that brings joy to life, even if it requires courage to step outside the comfort zone (within reason). I chose this book for the cover and subject matter but came away with a different perspective on life to consider. I also appreciated the fact that it showed the “human-side” of a well-known, very popular author. Johnson, Myra. One imperfect Christmas. Nashville, TN: Abingdon Press. 2009. 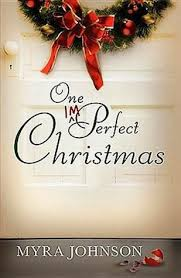 “One Imperfect Christmas” was an interesting read as it could be relevant to many lives. Definitely not a light Christmas story, this book was more realistic in looking at Christmas through the lenses of people requiring God’s grace in many situations. Though enjoyable, this book did tend to slow a bit in certain spots; however, the message was good (God has a plan even with the hard and difficult times in life). 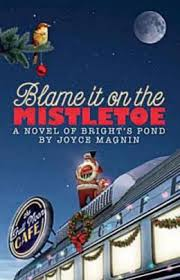 Living with regrets is never easy but the author, Myra Johnson, did a nice job with it. Well written for a debut novel; I look to reading more of her works. I really enjoyed the visit once again to Samuel and Annie. Weaving the story around a quilt actually worked very well, interspersed with different scripture lessons. Though I liked the prequel to this story, I adored this book even more. Once again learning a few of the Amish words and customs, I turned the pages quite quickly while being immersed in this truly delightful Christmas story. 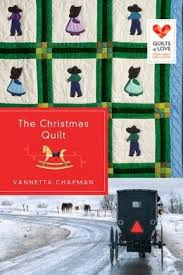 There are several books included in the Quilts of Love series which work just fine as stand-alone-reads. Parrish, Christa. Stones for Bread. Nashville, TN: Thomas Nelson. 2013. Liesl McNamara loves bread. For as long as she can remember, bread has been a part of her life. After following her dream, she opens a bread shop named “Wild Rise”. But soon her life is turned upside down by new employees, unexpected friendships and being featured on the Cooking Channel. Liesl must make choices that will change her life forever. In order to proceed forward, she must trust God and those around her. Is it possible? This novel is beautifully written. 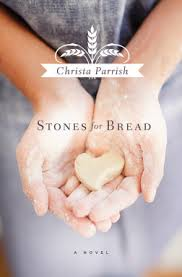 Parrish mixes in historical context about bread, provides in- depth perspectives of her characters and creates a story that holds the reader captive. Liesl’s passion for bread becomes evident as the reader moves through the story. For those who love to bake as well as read, they will delight in the recipes that are included in the book. Who knows…you might just be inspired! I look forward to reading more from Christa Parrish. Magnin, Joyce. Blame it on the Mistletoe. Nashville, TN: Abingdon Press. 2011. The residents at the Greenbrier Nursing Home have been acting strangely. The residents are suddenly riding tricycles, finding themselves caught under the mistletoe and even needing the police to end a scuffle. Top it all off with a suspicious police woman named Mildred as well as an unusual Hawaiian Thanksgiving dinner…things are about to get crazy!! Collins, Ace. The Christmas Star. Nashville, TN: Abingdon Press. 2012. For Jimmy Reed things have changed…life has become harder, he is angry at the world and he has no interest in Christmas…ever since his father gave his life for his country. While his mother puts up the Congressional Medal of Honor atop the tree each Christmas to remind herself of his bravery, all Jimmy can see is anger and betrayal. His father’s fellow soldiers, a mystery letter, an unexpected failed plan and mentoring all give Jimmy hope, as well as a refreshed look at life and events. 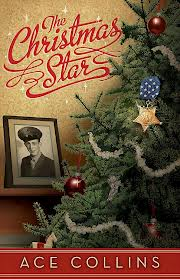 The Christmas Star was very appropriately named, not only for the physical medal but what it all represented. Taking place during WWII, this story is also relevant today with all the families involved in loved ones missing Christmas. I enjoyed watching Jimmy work through his feelings/thoughts/ actions while finally coming to terms and accepting events of life. Jimmy learned the life lesson of giving which should be so prevalent at Christmas time (as well as throughout the year). Per his biography, Ace Collins is a very successful author whose books I will definitely consider reading in the future. Ailee, Jennifer. 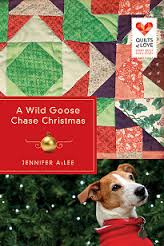 A Wild Goose Chase Christmas. Nashville, TN: Abingdon Press. 2013.